On the Saturday evening of Memorial Day weekend, I found myself seated at a snow-white draped table next to a card featuring my first and last name in italicized letters. The joyous occasion was the wedding of a childhood friend. It was no different from the other weddings I’ve attended, except for a violinist, who entertained guests as they were settling in for the feast. Since both the bride and the groom hailed from the former Soviet Union, the wedding took place in a Russian restaurant in Brooklyn, which meant that vodka, food, and entertainment were in great abundance. I instantly recognized the violinist. His name was Carlisle. I was happy to see him perform because he was my landsman and the best violin player I’ve ever known. His performance was a real treat for the guests, but I doubt most of them cared. It reminded me of an evening a few years ago, when Rasputin, a super-expensive Russian restaurant on Coney Island Avenue, hosted a famous pop star from Moscow. The pop star was offended by the patrons who didn’t pay her much heed. “Gentlemen, I am singing!” she exclaimed theatrically. “And we are eating,” was the ungentlemanly response. They both had a point. 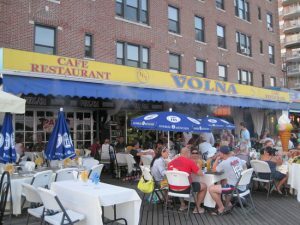 There are two kinds of good Russian restaurants in Brooklyn as far as I am concerned: on-boardwalk and off-boardwalk. When it comes to the rest of the United States, except for one decent place in Manhattan, Russian food is as tasteless as a Miami bagel. The on-boardwalk restaurants are situated between Brighton First and Brighton Sixth street. In summertime, waiters set up tables under canopies outside. Patrons check out passersby, and vice versa, while enjoying the sea breeze. The fare is similar for all Russian restaurants, but close to the ocean seafood dominates: smoked fish and snails for appetizers, snapper, trout, sea bass and branzino for the main course—grilled, fried and smoked. Take out fish bones yourself since fillets are for the little kids is the philosophy. Meat dishes are beef stroganoffs, Georgian style shish kabobs, spiced lamb chops and more. Borscht and kvas abound. Judging by people’s faces, they enjoy their food more on the boardwalk likely because of the fresh ocean air. Before visiting an on-boardwalk restaurant, I like to go for a swim. I head out past jetties that cut Brighton Beach in large rectangles, and then stop to look at the boardwalk and the Brighton Beach skyline from afar. To the left, there is the Coney Island amusement park with swinging and spinning rides. The rides change over time, as if revolving around the Cyclone and the Wonder Wheel. To the right, a block of new buildings makes up a recent development—an affluent community called the Oceana. A few years ago, the Oceana’s residents successfully resisted the construction of a new elevated public bathroom that would have impeded their panoramic view of the Atlantic Ocean from many of the Oceana’s apartments. The apartment owners prevailed but not without casualties. I know a man who was so depressed by the possibility of a public restroom facing his terrace that he sought medical treatment. He took anxiety meds, developed side effects and then took medications to relieve the side effects while the fight between the city and the Oceana raged on. Looking out from the water there is directly in front of me a chain of six-story-high buildings, all more than one hundred years old, colored in a beat up by the sun rusty red hue. I found them ugly on the first sight. I haven’t changed my mind entirely, but the Brighton Beach view has grown on me. After my swim, I change and take my seat at the table where a large mug of cold draft Pilsner and a plate of young potatoes sprinkled with dill and marinated herring on the side is expecting me. It feels good to be alive at those moments! I didn’t like what I saw in the kitchen. A huge sink, my workstation for the next eight very long weekends, had dirty bowls, frying pans, and the rest of the kitchenware rising from the bottom literally to the ceiling with even more bowls and buckets branching out to the sides. I was told the old dishwasher had quit the day before. Half of my time at the Jubilee I’d hear Eugene speaking in a high-pitched voice and often screaming outright. He would shove aside a cook and carry on with the work and then leave without saying a word. He liked parroting old patrons especially those with the thick Russian accents who were complimenting his food. “Eugene, we love your fries.” He liked impersonating them in his heavy Russian-Jewish accent which matched the heavy Russian-Jewish accents of his guests. Eugene didn’t speak much English. He had never taken English classes or had any education whatsoever. His home fries with mushrooms, butter and some of his own secret spices was indeed his signature dish. I once devoured an entire bowl and still could have eaten more. It was that day, scrubbing off the burned oil from the bowls that I heard for the first time on American soil a violin playing the Oginski Polonez. Without looking up from the dishes I was scrubbing I knew who was playing. I resisted an impulse to come and greet Carlisle since I was inappropriately dressed. Eugene would not be thrilled had he seen me in the dining hall. But it could only be Carlisle out there because of the beautiful way he played the Polonez. At the end of the eighteenth century in Poland, there lived a nobleman by the name of Oginski. Back in those days, Poland’s borders looked very different from what they are now. Poland possessed the land that now belongs to Belarus and Ukraine, the later country being my former home. However, Poland was no match for her even bigger neighbors, Prussia to the West and Russia to the East. These countries simply divided Poland between themselves. In the eighteenth century, however, the Poles had a hero. Tadeusz Kosciuszko, who later helped the American colonists prevail in the Revolutionary War and whose name one of the New York City bridges proudly carries, united the Poles. They fought hard, and Oginski and Kosciuszko fought too, but in the end they lost. Oginski fled Poland. Distraught about leaving, he composed a piece called Farewell to the Homeland, known today as Oginski Polonez. For five long years, I happened to attend the same music school, in Bila Tserkva, about 50 miles southwest of Kiev, where Carlisle taught. My classroom was adjacent to Carlisle’s and I heard his students struggle with the Polonez thousands and thousands of times. Carlisle also played it, and I learned by heart every note he rendered and every pause he took. Polonez became the musical piece I’ve heard most frequently and still I don’t find it boring despite or maybe because of its melodic nostalgia. Now that I was no longer a dishwasher but a rightful guest at a wedding, I went to say hello to Carlisle, my old friend. We talked for a while with Carlisle not stopping playing for a single moment. For him chatting while playing was nothing special. When he was young, he did stunts with a violin, including playing while hanging upside down from a tree branch by his feet and riding his bicycle as he played. Sometimes he’d have an accident and Carlisle and his bike would part ways, but he never let the violin fall out of his hands. I inquired with Carlisle how his older son Carl was doing. Carl himself was a gifted musician, just like his dad in whom he had the best violin teacher from the start. But when Carlisle and his family moved to America, Carl, to everyone’s shock, put aside the violin and never touched it again. He got involved with business and eventually became very successful. He owns a few car services and a luxury limo service where one of his drivers is his own father, who makes a living between playing the violin and driving one of his son’s limousines. Despite his success, Carl’s parents still consider him somewhat deficient because of the long held Jewish regard for a formal education. “Carl’s not like you Stas, he can’t persist with college or have a normal job,” Carlisle told me. He meant it as a compliment, but Carlisle was a great talent paying a compliment to a mediocrity. One can become wealthy or famous or get an Ivy League education but one can never become talented!